Display functions include auto off/release of display, automatic zero, and motion detection. With the push of a button, readings appear in pounds OR kilograms. 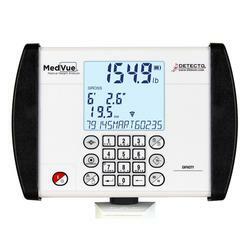 The 6439 features Body Mass Index calculation. The platform cover is easily removed for cleaning. Metric only models and handpost are also available. These 59" (150 cm) high digital scales features the eye-level at-aglance convenience of a battery-powered 0.5"/12.7 mm high-contrast LCD display. With the push of a button, readings appear in pounds OR kilograms and the weight display also calculates Body Mass Index. The 10.5" W x 14.5" D (27 cm W x 37 cm D) platform cover is easily removed for cleaning. Handpost and height rod combinations are also available. Please see the back page for different model numbers.